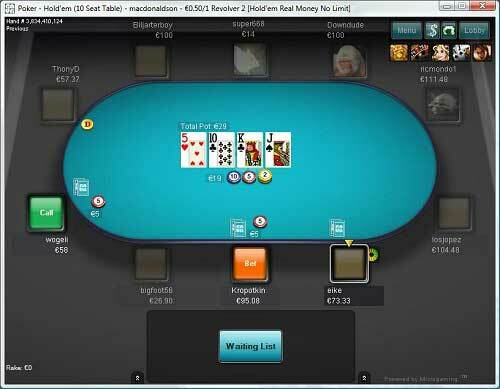 Betway Poker (formerly known as Gnuf Poker) has been a member of the Microgaming Network since 2009. Joining more than twenty other skins, has managed to hold down a reasonable number of players, with ring games filling quickly, and Tournaments running often. Being part of such a big network helps tremendously in regards to traffic and fishiness of their respective players. Betway offers a wide variety of games and stakes. From microstakes ($.02/$.04 blinds) all the way up to high-stakes poker ($50/$100 blinds) Betway is sure to have a game for every poker player. For those looking to play games other than Texas Hold’em Betway certainly has you covered. Players can choose from 5 Card Draw, Omaha, Omaha Hi/Lo, 5 Card Stud, 7 Card Stud, and Razz. US Players are not permitted at Betway poker due to UIGEA Regulations, so this site is only offered to our Non-US Players. During peak times there can be more than 9,500 players connected, providing action at most of the micro, small, and mid-stakes games. In addition to their normal ring tables, Betway offers “anonymous” tables where all player names are hidden during ring game play. SNG grinders will find a large variety of games and stakes at Betway Poker. The buy-ins start at just 25 cents, and go all the way up to $1,000. There are many different formats including normal, turbo, super turbo, and extreme style SNGs. Betway also offers heads-up SNGs which pits one player against another in a winner-take-all format. Just like their cash games there is plenty of action at the lower stakes; however, after the $20 buy-ins the player base dries up considerably. Betway’s Scheduled Tournaments fill up well at the Micro Limits, but beyond those the player base seems to be quite small. Most of the tournaments running were freerolls, and their bigger events had trouble filling up. Even a $10 NLHE Tournament which started at 5:00pm GMT attracted less than 100 players. Betway runs a few smaller promotions, including a monthly rake race which can pay out more than $10,000 to their members. Their 200% up to $750 initial deposit bonus is a nice offer, but it can be a chore to grind with a lack of higher stakes games. The Microgaming software is very plain, simple, and easy to use. The Main Lobby is a breeze to navigate, with cash games, Sit & Go Tournaments, and Scheduled Tournaments headlining the top of the screen. All of the filters are obvious and simple, as players can choose what type of games, stakes, and limits they would like to appear in their lobby. The Full Ring games at Betway Poker are 10-handed, and they have 5 and 6 handed cash games and SNG tables. It appears the maximum number of cash game tables a player can have open is 10. For those playing that many tables the resizable table function certainly comes in handy, as players can tile, cascade, or custom resize their tables. The lobby also offers some interesting features, including a buddy-list under the “Friends” button found at the bottom of the screen. This is great for finding players you have played against in the past that you might want to play again in the future. Other navigation buttons include a link to their casino where players can enjoy slots, roulette, blackjack, and other table games. Overall the software is some of the easiest to use online. Everything is in plain sight, including bet and pot sizes and sound alerts make sure players stay on top of their multiple tables. Being part of the Microgaming network has helped Betway Poker to build a rather steady player base, particularly at the Micro and Low Limits. There are plenty of games to go around at the micro stakes, but once play hits the mid stakes there is a dramatic drop-off. This holds true for all SNGs and Tournaments as well, with the overwhelming majority of the action taking place at the $20 Buy-in level and below. While there are plenty of tables open in the lobby, most of the higher stakes involve one player sitting, waiting for another to join. During non-peak times the highest full-table game running was at $3/$6, where 2-3 tables might have 5-6 players. What Betway Poker lacks in traffic it more than makes up for in fish. There are plenty of bad players at all levels, a major tendency for non-US poker sites. The players tend to be loose/bad who either won money in a freeroll or are the typical weekend gamblers who throw $50-$100 online to have a good time. There is good money to be made while trying to clear Betway’s initial deposit bonus. Betway offers a rather large 200% up to $750 initial deposit bonus. Remember to sign up using FTRs links and enter the Betway Poker promotion code FLOP when creating your account. Then deposit any amount up to $375, and Betway will grant you double that sum once you have earned enough Loyalty Points. In order to clear the bonus you must generate a certain number of Loyalty points which are earned by playing raked pots in cash games or fees in SNGs/Tournaments. For every 100 Loyalty Points you earn $1 in bonus will be credited to your account. For example, those depositing $100 must earn 20,000 Loyalty points to clear their entire bonus and earn the $200. The amount of Loyalty Points you earn per dollar paid in rake and tournament fees is 10. Please note the bonus expires 45 days after your initial deposit, so be sure to play enough poker to get your money’s worth. The bonus is only released towards the beginning of every calendar month for the points generated in the previous month. This means that you may receive the bonus money in one, two or three installments depending on the exact dates when you make your deposit and begin playing. As a new player, you’ll be entitled to enter weekly €500 New Player Freerolls and €1.10-buyin €500 Added New Player tournaments. You’ll be eligible to enter up to six of each type of tourney during your first six weeks at Betway. With the Betway Poker Loyalty Club, you’ll be able to trade in some of your loyalty points for a cash payment every month. The higher you climb the levels, the more of your points you’ll be able to convert. At the highest level, Black, players can achieve 30% in rakeback equivalent through converting their points. It may be worthwhile to get to Black level especially since doing so merely requires you to pay $200 in rake/fees in a month. They are available to answer your questions 7 days a week between 8 am and midnight CET in your preferred language.